Those 11 days changed my life like very few moments ever had. I had been corresponding with Patch Adams since before the movie came out, yet had never met him face to face. When we finally met it was like we had known each other for more than a century. 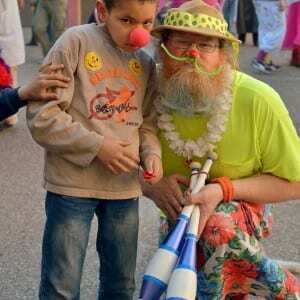 As a clown, you develop a certain fearlessness. You turn off your reactions in order to truly be present in the moment. You enter a room with a child possibly losing a fight with cancer, yet something inside you won’t let you show the sadness you may feel. That child needs something else from you. A moment of playfulness, a smile and a laugh, a few minutes of distraction from the situation, to feel like a kid. 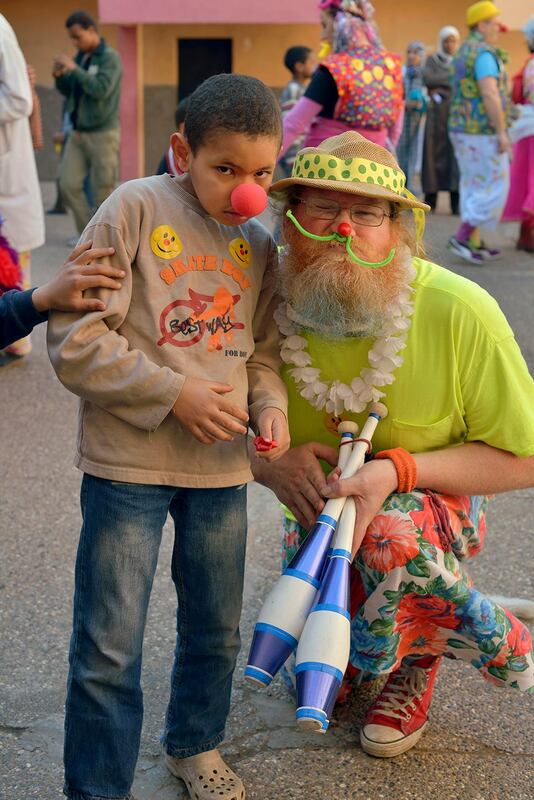 When you clown you care with all of your heart, and maybe that caring is the true essence of humanitarian clowning. You become friends. As you walk away the emotions hit you, your legs shake and your balance waivers and that is when another clown grabs you and holds you. With open hearts, the clowns care for each other as well and together you heal parts of yourselves that you didn’t know needed healing. It changes you, not just there in the moment, but forever. Morocco is a beautiful country and the people were very loving and kind. I learned things I would have never learned. I healed a part of my life that I had been taught not to trust. We spent 8 to 11 hours a day clowning for children. We traveled together feeling safe with the bus trips and food all pre-planned for us. One night, 20 of us even went out dancing in our clown costumes. What a scene! On the last days locals would come up to us and say thank you! We know you can’t stay, but please come back. Well, we are going back! 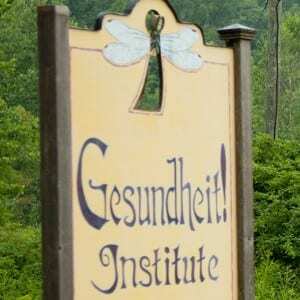 Gesundheit is going back to the kingdom of Morroco! Still a few spaces left. La la la loves you! 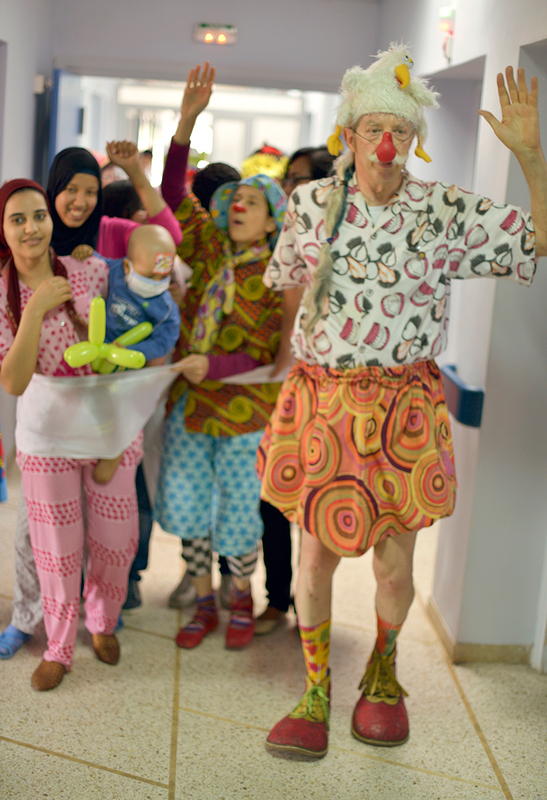 Register NOW for the 2016 Morocco Clown Tour with Patch Adams & Gesundheit! Global Outreach! 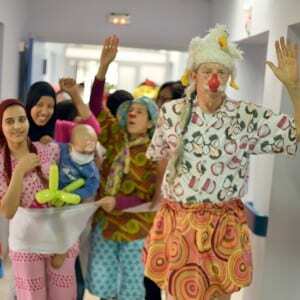 Don't miss this opportunity to travel with Patch Adams. 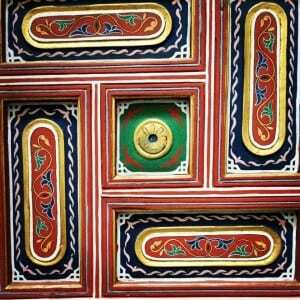 This is a one of a kind trip to Morocco!